THE EUROZONE HAS received new bailout reform plans from Greece, a spokesman for Eurogroup chief Jeroen Dijsselbloem said tonight, less than two hours ahead of a midnight deadline. Greeks overwhelmingly voted in a referendum on Sunday to reject previous austerity demands from international creditors in exchange for a new aid programme to replace the one that expired on 30 June. At 9.30pm it seemed there may have been a hitch with the proposals as signed letters were not initially forthcoming. Just after 10pm the requisite signed letters were received and the technical hitch was averted. The cash strapped country needs money to reopen its banks which have been closed for nearly two weeks, and eurozone leaders have warned that the European Central Bank will cut emergency funding if it does not reach a new deal. 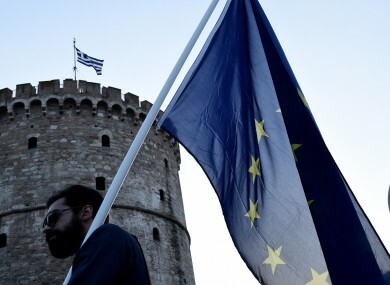 The new reform proposals will now be scrutinised by officials from Greece’s EU-IMF creditors, before going before eurozone finance ministers on Saturday and a full summit of all 28 European Union leaders on Sunday. “The (creditor) institutions will examine them to give their view to the Eurogroup,” a European source told AFP on condition of anonymity. They also need these proposals to determine the size of the bailout programme – that will also depend upon broader economic scenarios. Greece’s application letter on Wednesday to the eurozone’s bailout fund, the European Stability Mechanism, called for a three-year programme but did not say how much money was needed. Greek Prime Minister Alexis Tsipras vowed yesterday to present “credible” plans to seal more emergency loans from his exasperated European creditors ahead of a summit of all 28 EU leaders on the debt crisis on Sunday. “The Greek government will tomorrow file new concrete proposals, credible reforms, for a fair and viable solution,” Tsipras told lawmakers at the the European Parliament in Strasbourg. Greeks decisively rejected the latest bailout offer from EU leaders in a referendum on Sunday. But the euphoria felt by some Greeks after the vote has quickly faded as capital controls have extended into their second week, limiting ATM withdrawals, and fears have grown over dwindling supplies of food and medicine. Eurozone leaders lost patience with Greece on Tuesday after Tsipras and his new finance minister Euclid Tsakalotos showed up to a summit with no proposals. However, the Greeks have officially decided to play ball. In a formal letter to the European Stability Mechanism (ESM) – the EU’s lender of last resort – Tsakalotos said Greece would “immediately implement a set of measures as early as the beginning of next week”. With additional reporting from AFP and Cianan Brennan. Email “The EU have now officially received Greece's bailout proposals”. Feedback on “The EU have now officially received Greece's bailout proposals”.